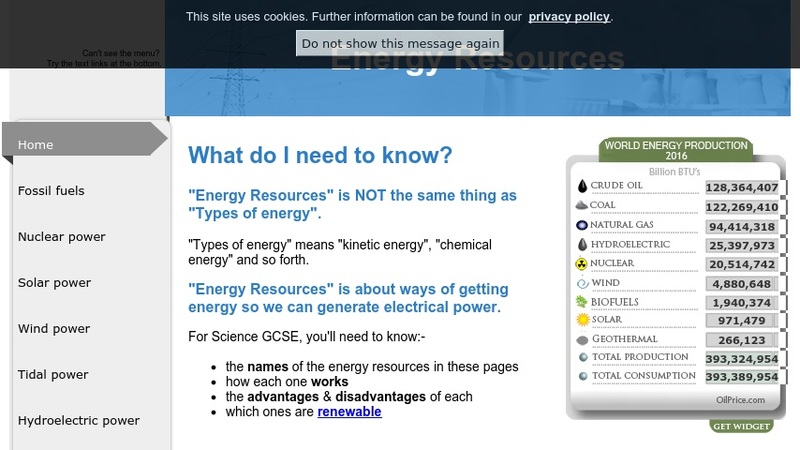 This award-winning web page is devoted to the study of energy sources, both renewable and non-renewable. It features multimedia content on nine sources of energy: fossil fuels, solar, wind, geothermal, nuclear, biomass, hydroelectric, tidal, and ocean waves. Each section is supported with video clips, diagrams, schematics, and images of how the energy source is used to deliver power. The author discusses advantages/disadvantages of each energy source and provides links to additional information for extended learning. The content of this resource is written at a Grade 9 level. Extensive integration of video, diagrams, and schematic drawings makes the collection especially appropriate for accommodating a variety of levels and learning modalities.